Susanne Mandrup, head of the DNRF center ATLAS, has a new state-of-the-art tool available for her genetic research related to obesity. The new instrument makes it possible to analyze hundreds of genetic samples much faster and cheaper than before. A late Christmas gift recently arrived at the Center for Functional Genomics and Tissue Plasticity (ATLAS) at the University of Southern Denmark. In early January, a so-called Illumina NovaSeq 6000 was installed at the Department of Biochemistry and Molecular Biology. The NovaSeq is the latest and most advanced high-throughput DNA sequencing platform from Illumina, a company that develops systems for advanced genetic analysis. The new instrument is part of the University of Southern Denmark’s co-financing of ATLAS and is only the second of its kind in Denmark. 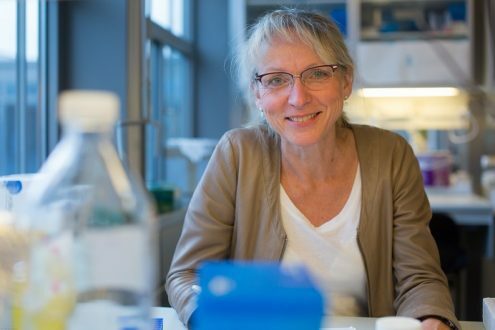 The new NovaSeq will be an important workhorse for the head of the center, Susanne Mandrup, but it will also be available to other research groups at the university. The overall aim of ATLAS is to determine how obesity alters properties of specific cell types in liver and fat tissues. By combining high-throughput sequencing with different biochemical technologies, researchers in ATLAS will determine changes in gene expression as well as changes in the epigenomic programming of different cell types in the liver and adipose tissue in response to obesity. The high capacity of the new NovaSeq allows the researchers in ATLAS to study cellular gene expression thoroughly by sequencing RNA from hundreds of mouse or human samples and run both types of samples faster and at lower costs than before. Furthermore, the scalability of the instrument gives an astonishing data output of up to 20 billion sequencing reads per run. This is at least a 10-fold upgrade compared to the Illumina HiSeq 1500 sequencing platform, which is already an integrated part of the research unit. The first data are already being analyzed by the new NovaSeq. ATLAS opened in November 2017. Read more about the center here.